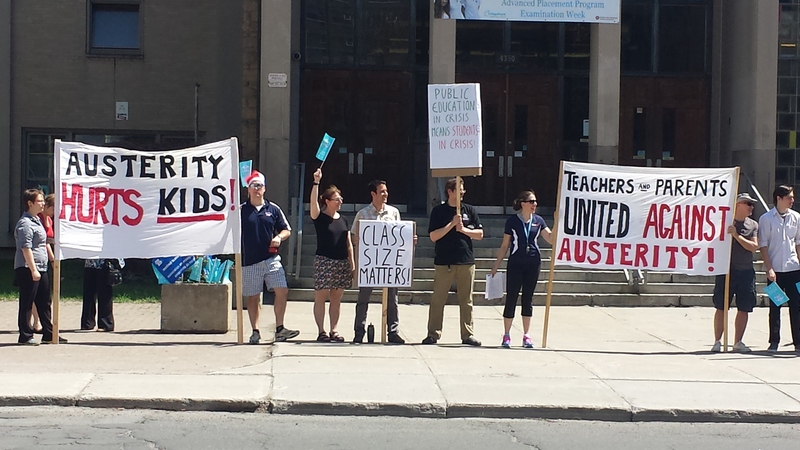 Teachers Catharine Hogan and Robert Green pull no punches in discussing the PLQ’s ongoing assault on public education with James Mennie (sitting in for Tommy Shnurmacher). Originally aired February 17, 2015. Anne Lagacé-Dowson, Robert Green and Trudy Mason discuss cuts to parental leave and the Couillard government’s austerity agenda. Will the Liberals ensure schools get proper funding? Along with just about every teacher in the province, I was left speechless by Liberal Education Minister Yves Bolduc’s statement last week that “no child is going to die from (budget cuts) or stop reading because there are already books” in school libraries. That such words would be uttered by a minister of education is just baffling. Either Bolduc is unaware of the very serious impact of denying Quebec’s schools the resources they need to get kids excited about reading, or he simply doesn’t care about the quality of education in Quebec’s public schools. That this statement happened to also have been made by a man who saw no problem double-dipping into Quebec’s public coffers for over $200,000 in personal gain is downright infuriating. Thus far, the government’s attempts at damage control have done little to restore confidence. While Bolduc has apologized for his statement and both he and Premier Philippe Couillard have affirmed that it’s important for school libraries to be able to purchase new books, neither has provided an alternative that won’t affect the province’s most needy students in other ways. Both have made vague suggestions that school boards should choose to cut elsewhere. This of course raises the question of where exactly school boards should cut. The message being sent here is unmistakable: Tough choices, sacrifice and austerity are for the common people, not Quebec’s elites. Though his government has been in power only a short time, this is not the first time it has sent such a message. The government’s first budget contained cuts to school boards that are likely to seriously affect the services provided by already underfunded public schools, while leaving the subsidies wealthy families receive to send their children to private schools untouched. Apparently it is for the children of Little Burgundy to shoulder the burden of repairing Quebec’s public finances, not the privileged children who live up the hill in Westmount. In 2010, Finance Minister Raymond Bachand called for a “cultural revolution” of austerity. This revolution led directly to the longest student strike in Canadian history and the defeat of Bachand’s government. Now back from exile, and sporting a new leader, the Liberals are set for round 2. However, a cursory examination of Quebec’s recent spending trends shows a very different picture. With the exception of a spike in stimulus spending following the 2008 economic downturn, Quebec’s expenditures as a percentage of GDP have been trending downward since the early nineties. Even at the height of stimulus spending in 2009-2010 Quebec was spending significantly less as a percentage of GDP than it was in the early nineties. This is hardly a picture of out-of-control spending. So if spending is not the cause of our current economic predicament, what is? The answer lies on the other side of the balance sheet, in revenues rather than expenditures. On June 13th the Gazette published a letter entitled “Education won’t be able to escape budget belt-tightening” by Jim Wilson. The letter was an attack on my recent op-ed about the injustice of the Liberal government’s austerity measures for education. As Mr Wilson is a well known commentator on Quebec’s English school system whose writing has been often published on this blog, I feel it is important to publicly respond. The whole reason I submit articles to the Gazette is to stir up public debate. Though I strongly disagree with the positions Mr Wilson takes in his letter, I am more than happy to debate these issues with him. I hope this exchange of ideas will be interesting and informative for readers. As Mr Wilson’s letter raises a number of points and poses a number of questions, I will deal with them one paragraph at a time. 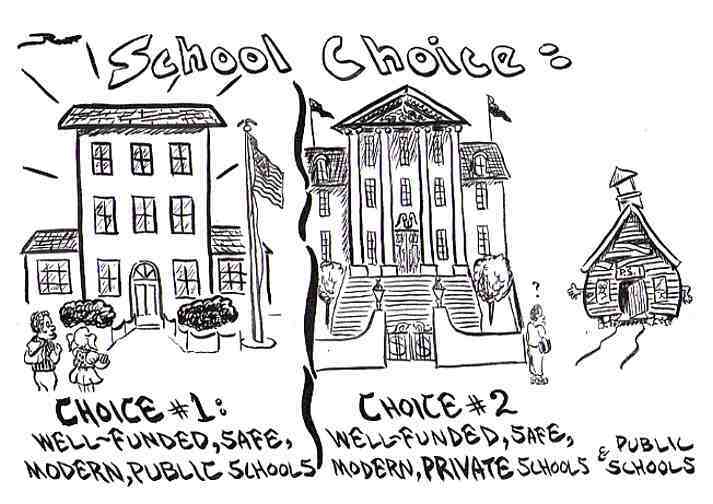 Robert Green makes one point that I fully support: that public funds should not be used to support private schools. However, he fails in his principal arguments that the budget means that “the neediest students are asked to make serious sacrifices” and that cutting the private-school subsidies would do much to remedy the overall financial situation. Actually my principal argument was not about remedying the province’s overall financial situation so much as it was about the injustice of imposing austerity on the public education system while leaving generous subsidies for the rich to attend private schools untouched. I’m surprised that someone who claims to oppose public subsidies for private schools doesn’t share my outrage over this blatant injustice. A secondary point of my op-ed was to show that there is no good reason to exempt private school subsidies from sharing in the burden of austerity. The private schools claim these subsidies save the system money. However, this is a highly questionable claim due to the other forms of government support private schools receive (listed in my article) in addition to the 60% tuition subsidy. While the FAE’s claim that there are significant savings to achieve by integrating private school students into the public system may also be somewhat questionable, even if this reintegration is cost neutral it is still extremely worthwhile as it will eliminate the significant social costs associated with an education system that is segregated along class lines. There’s a very good reason the Couillard government wants to avoid using the word “austerity”. 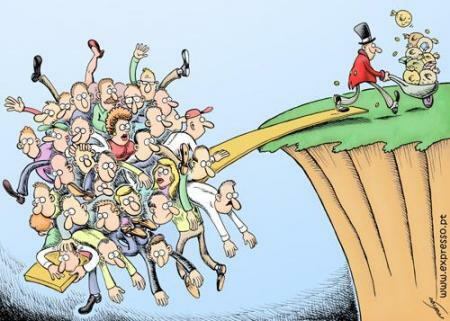 The word has become associated with a villainous act that evokes the names of such detested figures as Ebenezer Scrooge and the Sheriff of Nottingham; the act of taking from the poor to give to the rich. 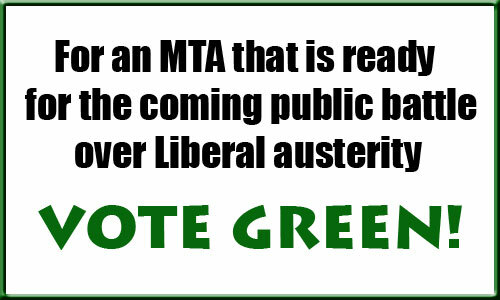 However, avoiding the use of the word austerity may not be enough to prevent Quebecers from seeing the villainous truth behind the recent Liberal budget. Nowhere is this more true than with respect to the Leitão budget’s implications for education. While Quebec’s wealthy will see no change whatsoever to the generous subsidies they receive to send their children to elite private schools, the province’s most needy students will be asked to make do with less. The Leitão budget has extremely serious implications for Quebec’s public schools. It imposes cuts of $150 million for 2014-15, restrains growth in spending to a paltry 2.2 percent for the years following and freezes hiring for administrative posts. The reason these cuts are so serious is that they are being imposed at a time when Quebec’s public education system is already in crisis. School boards are in financial crisis having already been cut to the bone thanks to the $640 million in cuts since 2010. Some have resorted to running deficits while others have sought to raise school taxes. The notion that school boards still have bureaucratic fat that can be cut without affecting services to students is contradicted by both the school boards themselves and public sector unions. Schools are in crisis due to the growing number of special needs students – a crisis exacerbated by a large and growing private school system that is permitted to use entrance exams to filter out such students, causing them to flood into public schools. The spending cuts mean that there will be even less money for psychologists, child care workers, speech therapists and drug councillors. In other words, fewer resources that can offer children with special needs the fighting chance they deserve. Though education is an issue of great importance to Quebecers, the only education-related issue discussed in the recent election campaign was the question of where in the education bureaucracy to find savings that could be redirected to schools. Coalition Avenir Québec Leader François Legault said he favoured abolishing school boards, while Liberal Leader Philippe Couillard said he wanted to trim the staff within the education department itself. Trimming bureaucratic fat sounds appealing, but it can also have grave consequences for the quality of services. This is particularly true in the case of school boards that provide front-line services to students. Now that Couillard is set to officially take over as premier this week, I have a modest proposal for him: He could save some money by cutting the bureaucracy involved in the production and administration of high-stakes standardized tests. 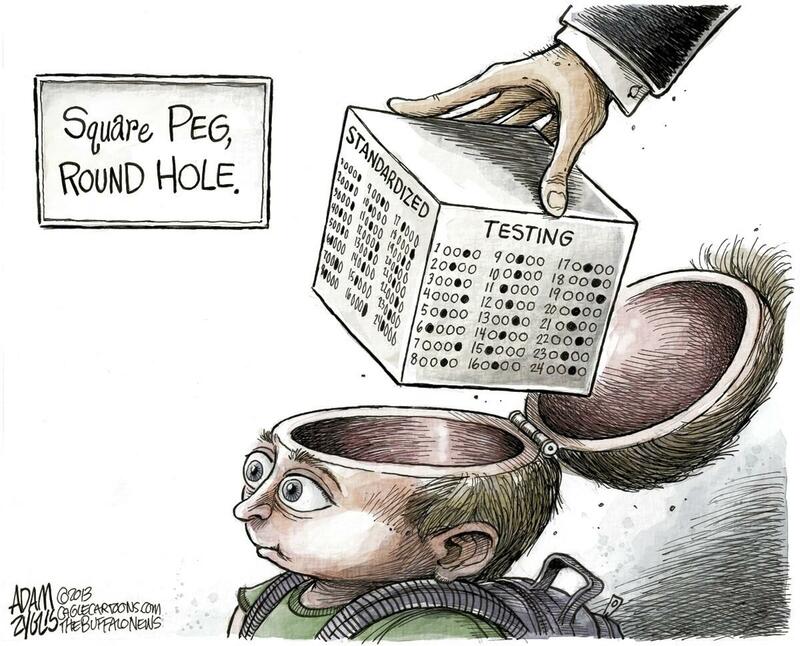 There is not a shred of evidence to suggest that such testing does anything to improve educational outcomes. For more than a decade, the U.S. has been involved in an education reform driven by standardized-test results. Over this time, student achievement has not improved, while a host of other negative effects have been observed: the narrowing of curriculum, the widening of achievement gaps related to race and class, and growing rates of student stress and depression. The problems with standardized testing have become so serious that there is now a growing movement of parents and educators in the U.S. advocating that parents opt their children out of such tests. Meanwhile, the country whose students consistently rank highest in the world, Finland, imposes no standardized tests whatsoever. Finland’s approach is to focus on equity over excellence, ensuring that all students, regardless of their backgrounds, are given the support they need to succeed. Finland worries about the resources going into schools, while the U.S. worries about the test results coming out of them. Quebec needs to learn from this.